No matter who can't drink bitters ! Containing more than 1.2% "Acteocide"
The Sesame Leaves Cultivated with LOVE, Plentifully inside. For vegetable deficiency, health and beauty. Germinated Brown-rice Fermented Extracts (GABA) Mixed in. Off course, no Agricultural chemicals between cultivation. 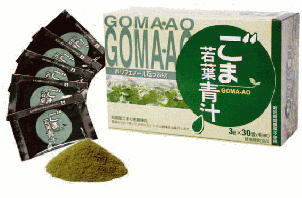 Furthermore, only pure Japanese Sesame Leaves used. Drink with a cup(about 180cc) of water(hot water) or soy milk.